We usually have a semi-fancy Friday dinner, our version of a Sabbath dinner. This week, because #2 Son was coming home from camp on Saturday, I postponed it. Then I remembered that #1 Son was going to a concert on Saturday, so I postponed it again. Which brings us to Sunday. I often bake something for Sunday breakfast, and the presence of some Nova lox in the fridge reminded me that it’s been a while since I made bagels. I keep trying various recipes, seeking the überbagel — the mythical perfection that probably exists nowhere but in my mind. Today’s was pretty good, though; I got it here. I modified it a bit (thanks to the comments on the site), mixing a sponge the night before and adding brown sugar to the boiling water. The bagels were good, chewy and dense and almost right. 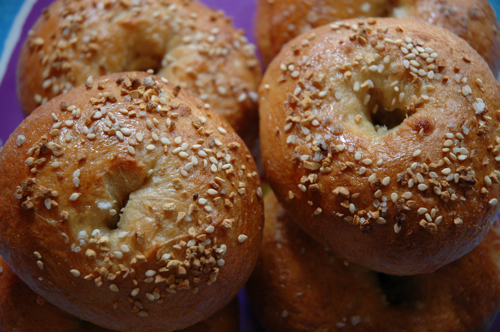 I would make this recipe again, but next time I’ll make the dough and shape the bagels and let them sit in the fridge overnight like that — I think that might provide the last bit of awesome to the crust. And then there was dessert, which was this week’s TWD. More on that on Tuesday! This entry was posted Sunday, August 3rd, 2008 at 7:58 pm	and is filed under Uncategorized. You can leave a response, or trackback from your own site. I love George Greenstein’s book – I have it, too. 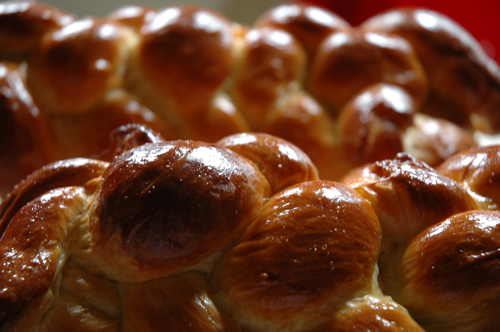 Your challah looks gorgeous! Gorgeous challah and bagels! I may have to try making my own bagels now.